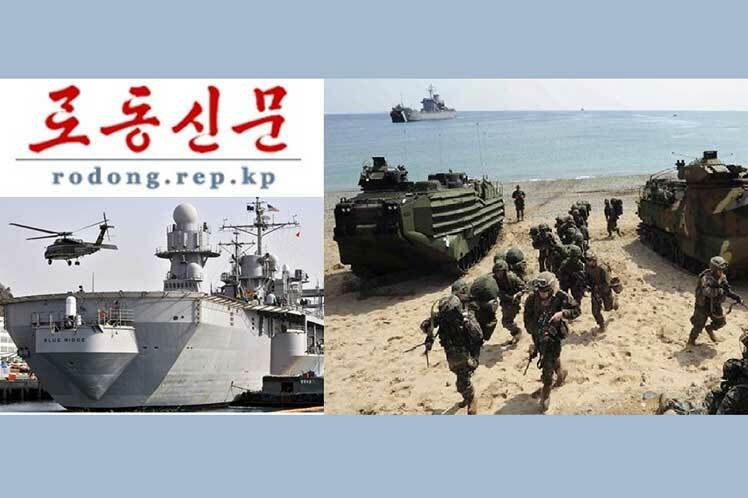 The Democratic People’s Republic of Korea (DPRK) again denounced the militarism of South Korea, in an opinion piece of the Korean Labor Party newspaper (PTC), Rodong Sinmun. The newspaper criticized that recently under the pretext of exchange, cooperation and promotion of friendship, docked in the harbor of the naval base of Pusan, at the southern end of the peninsula, East Sea of ​​Korea, the flagship of the VII Fleet from the United States, Blue Ridge. This event happens for the first time in 36 months, and the objective of this anchoring was to land in neighboring territory a part of the North American reinforcements that will participate in joint military exercises called Key Resolve. These warlike maneuvers are planned for the beginning of March in areas bordering on the jurisdictional territory of the Democratic People’s Republic of Korea (DPRK). The media of the PTC reminds that the arms increase and the war exercises in the South of Korea totally contradict the references made by delegations of the DPRK and the US, in their path to reach a true detente and peace, in the peninsula from Korea. Also to texts signed at the end of April 2018, in Panmunjom, and last September 19 in this capital, by the North Korean leader, Kim Jong Un, and the president of South Korea, Moon Jae In. For this reason, the conduct of those who speak face-to-face of detente and peace is causing concern within and outside the DPRK, and they are trying, from behind, to resume the joint military exercises of South Korea-USA, introducing military equipment to the DPRK. South of the 38th parallel, says the newspaper. Rodong Sinmun said that dialogue, war training, peace, military hostility and military pressure against North Korea are incompatible, with the improvement of relations between Seoul and Washington with Pyongyang. It warns that the awkwardness in the communications between the North and the South of the peninsula and DPRK-US, can lead to a serious result for the enemies of North Korea. He asked Seoul for prudence before the consequences of the dangerous military actions that give continuity to militarism and military maneuvers that will not intimidate North Korea.